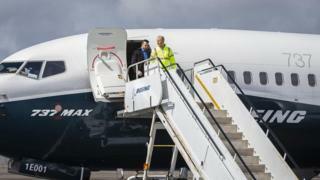 Boeing's boss has admitted that a failure in its 737 Max jet's anti-stall system, MCAS, was a factor in last month's Ethiopian Airlines crash. However, apart from talk of cancelled orders from some carriers, airlines have, so far, stuck with the plane and 5,000 orders remain on Boeing's books. I think you have here the fundamentals of the "rolling unravelling" of a strong Boeing brand. Boeing's strength was built up over decades, but it meant many made the mistake of regarding the first incident [Lion Air] as a "one-off". When it became "two-off" on a fleet of just over 350 aircraft, which were also a new variant and a 4th generation design of an aircraft that had design roots in the 1960s, the alarm bells sounded. Airline customers are unlikely as yet to cancel current orders - although at the very least the market for Max aircraft is likely to soften for a while. There's a further cost to consider, as carriers awaiting aircraft and having to put emergency plans in place are going to seek financial compensation. But in the long term, given there are more than 14,000 single-aisle aircraft in service globally and half of these are Boeings, it is hard to see a scenario where the Max is not returned safely to service and in the long run accepted by the travelling public as a safe aircraft. For the passengers? We're emotional beings. I've had friends around me asking whether I'll be flying on a Max. Mostly people simply don't know what they're flying on and don't really care. When I ask people 'what did you fly on?' - most don't even know if it's an Airbus or a Boeing. This though will sharpen people's attention, for the short term at least. The other constituents that need reassurance are pilots, after all, they're the ones with the responsibility for safety in their hands. There is an old saying in the aviation industry that illustrates how airlines tend to look at aircraft and engine manufacturers: "You sell (engine) thrust, we buy trust!" Throughout Boeing's history there has been a strong commitment to safety. In the spirit of this tradition, Boeing - in co-operation with regulatory authorities and the airline community - should focus on identifying the root cause or causes of the recent 737 Max accidents and then put in place well tested substantial solutions rather than premature "symbolic" band-aids. So it is important for Boeing to communicate candidly and honestly - and empathetically - both with airlines and passengers as the accident investigation and product improvement process moves along. The video statement by Boeing's chief executive is a good step in that direction.